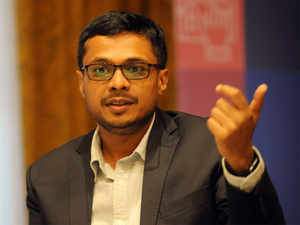 BENGALURU | MUMBAI: Flipkart co-founder Sachin Bansal is betting big on the domestic financial services sector as he looks to acquire a majority stake in a Bengaluru-based microfinance firm, two people familiar with the matter said. A successful transaction could also result in Bansal taking the top job at the firm, marking his return to an executive position, the sources said. The 37-year-old internet billionaire is expected to pick up as much as 75% stake in Chaitanya Rural Intermediation Development Services which runs a microfinance institution, Chaitanya India Fin Credit (CIFCPL), according to the people cited above. The deal, which may be a mix of primary and secondary sale of shares, is in the final stages of closure and will be Bansal’s first equity investment in the financial services space. “Bansal could take up the role of the company’s CEO once the transaction goes through,” a person close to the development told ET. “He is very keen to explore opportunities at the intersection of technology and user experiences in the banking domain,” this person added. Bansal left the company he founded last year selling his entire shareholding of 5.5% to Walmart as part of the sale of Flipkart to the US retail giant. When contacted by ET, Bansal said he did not have a comment to offer on the development. Samit Shetty, cofounder of Chaitanya, said his company was in the process of raising Rs 150 crore in primary capital and had spoken with multiple prospective investors for the fundraise. “To name anyone specifically would be premature,” Shetty said. The transaction, sources said, is estimated at Rs 200 crore and will be routed through Bansal’s holding company BACQ which he co-founded along with a former Bank of America banker Ankit Agarwal. BACQ has been investing actively in the NBFC space in recent months. 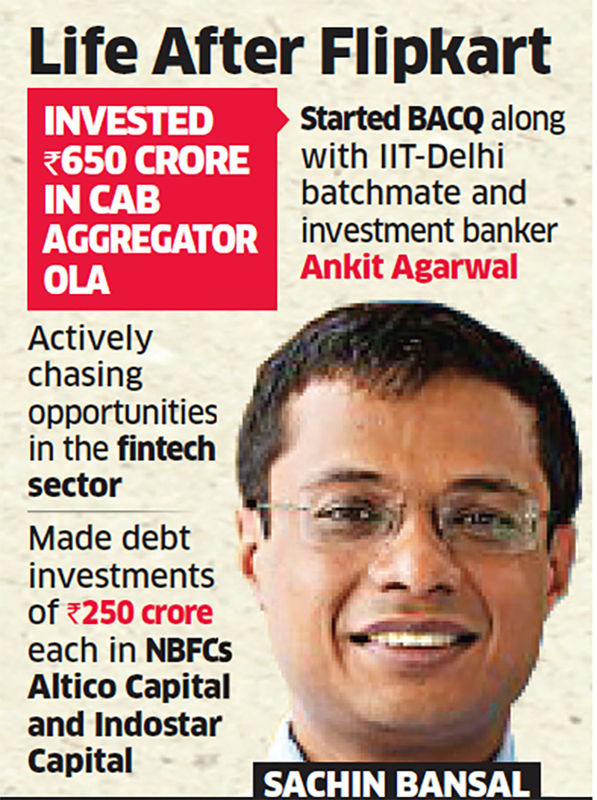 It pumped Rs 250 crore each as debt in Altico Capital and Indostar Capital as Bansal tries to cement his space in the fintech industry. “The acquisition will require a regulatory nod from the RBI both for change in ownership of Chaitanya and for the BACQ nominee directors to come on board. This may take up to six months,” the person cited earlier in the report said. Founded in 2009, the Bengaluru-based microfinance company currently operates across Karnataka, Maharashtra and Bihar, providing joint liability group loans along with financial literacy programmes to rural communities across the three states. CIFCPL’s total loan book is around Rs 625 crore. Shore-Cap, which specialises in backing small business banks and microfinance institutions, is the lead investor in the company which has till date raised around Rs 80 crore of capital. It was founded by Shetty and Anand Rao. “It is not clear if these existing investors are seeking an exit through this transaction or will stay back under the new management,” another person aware of the deal said. Multiple sources ET spoke to said that Bansal has been actively chasing the idea of launching a private bank. ET reported in its February 21 edition that the internet entrepreneur had met with top executives at the RBI to ascertain the regulatory requirements for opening a bank. “To receive a banking licence, the applicant needs to show a strong experience in the financial services sector which is something that Bansal lacks, having led an ecommerce business. The acquisition of a microfinance institution or an NBFC could be part of his strategy to learn the tricks of the financial services business and then apply for a banking licence,” said one of the sources aware of the development. Unbelievable, but this bank has a problem of plenty!